The indigenously developed newborn hearing screening device – SOHUM was formally launched by the Minister of State for Science and Technology & Earth Sciences, Shri Y.S. Chowdary, in New Delhi today. The newborn hearing screening device developed by School of International Biodesign (SIB) startup M/s Sohum Innovation Labs India Pvt. Ltd. This innovative medical device has been developed under Department of Biotechnology (DBT), Ministry of Science and Technology, Government of India supported (SIB). SIB is a flagship Program of the DBT aimed to develop innovative and affordable medical devices as per unmet clinical needs of India and to train the next generation of medical technology innovators in India, it is a valuable contribution to the Make in India campaign of the Government. This Program is implemented jointly at AIIMS and IIT Delhi in collaboration with International partners. Biotech Consortium India Limited manages techno-legal activities of the Program. 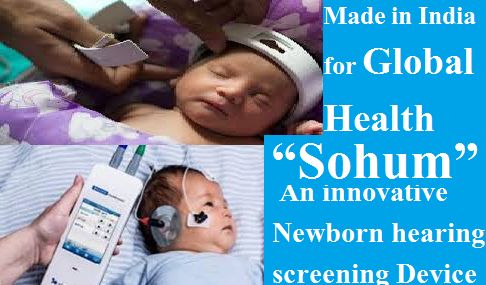 “Sohum”- An innovative Newborn hearing screening Device The indigenously developed newborn hearing screening device – SOHUM was formally launched by the Minister of State for Science and Technology & Earth Sciences, Shri Y.S. Chowdary, in New Delhi today.